Like most of you in the Northeast, I am very, very over this winter. The seemingly endless bouts of snow and bone-chilling temperatures has left me yearning for warmer days. I can only imagine what it has been like for oyster farmers up and down the coast. In my hope to warm up your screen and spirit, here's a recap of my trip to Duxbury Bay from my Cape Cod Oyster Tour adventure last summer. UPDATE #2 — May 15, 2018 — Availability of King Caesars from Duxbury, MA have changed, along with Paul's professional whereabouts. Updates are noted at the end of the story. UPDATE #1 — September 25, 2015 — Since publishing this story, a few things have changed and have also been corrected. These are noted within the post and further explained at the end of the story. Duxbury v.s. Island Creek: What’s the Difference? I realize that Duxbury Bay is not actually part of Cape Cod, but I still embrace it as an important part of our epic oyster farm road trip. After all, Duxbury Bay is home to some remarkable oysters and oyster growers. The bay is approximately three miles long from north to south with an average width of two miles. The bottom is mostly shallow sand and mud flats exposed at low tide, embellished with a few winding channels. Its unique geography produces some of the most wonderfully flavorful oysters (and people) around. Had we been like most other food writers, we would've gone out with the highly celebrated and fun-spirited gang at ICO. Naturally, Michelle and I decided to be renegades instead. Meet Paul and Matt Hagan: brothers and business partners of Duxbury Bay Shellfish Company, a small seafood brokerage company that Paul started when he was 18 to move clams and striped bass. Today, Duxbury Bay Shellfish markets and sells premium-grade King Caesar Oysters™ and Deluxeberry™ Clams. Like ICO, Duxbury Bay Shellfish maintains their inventory with the help of a few select growing partners. Unlike others, they work under a different vision altogether. Paul has spent over a third of his life in the seafood business. He harvested his first oyster in Duxbury a decade ago when he was 16 (you do the math). In 2012, Paul moved to Charleston to sell oysters and coined the King Caesars brand name. Over the course of his career, he's worked on three different farms in Duxbury, managing one owned by Pangea Shellfish. Nowadays, Paul juggles multiple ventures during the year: in the summer months, he manages an oyster farm in Duxbury owned by Phillips Tree and Construction, a local construction business, full time. During the winter, he broker oyster deals, shucks and cooks oysters for Legal Seafoods in Braintree. All of the hustle, he admits, makes him "feel like an old man." To Michelle, Paul was more like, "an old boy and a young man." A very fitting descriptor indeed! On a bright and crisp August day, my friend Kacy, Michelle and I and enjoyed a hearty lunch of steamers, chowder and fries at Snug Harbor Fish Company, a neighborhood seafood shop and take-out restaurant. Afterwards, we met up with Paul and walked over to the boat launch, where he introduced us to his little brother Matt. When he's not in school studying Marine Affairs at the University of Rhode Island, Matt is helping out with the farm work, the packing and shipping, or at events… wherever he is needed. As we glided past the barrage of boats and into open water, Paul began to point out the who's who of Duxbury's oystering community by their brightly colored floating workhouses. Each one had a moniker that matched its styling, from the dreamy "Cotton Candy Factory" to the comically endearing "Junkyard." Paul named his own house the "Empire State,” a bold choice for someone who resides so close to Boston. We slowed down over an area where if you peered over the boat, you could see the bottom. Paul dropped the anchor and Matt promptly hopped overboard in his waders. The water hit thigh-deep and low tide was still a few hours away. Matt picked up a black mesh bag, which popped and crackled like a roaring oyster party, and poured the contents across the bow. Paul sifted through a few and picked up one of the juveniles to show us. Even at this size, the oyster was growing quite a deep cup! The guys use a grow out process that is more or less the same as other farmers in the area, but they add an additional layer of culling at the end. By law, Massachusetts requires that all oysters sold in state must be at least 3 inches in length. Hence why Island Creek uses a 3" ring as a key icon in their brand identity. But Paul and team also critique the oysters for shape (must have a deep cup), weight (the heavier the better), and overall appearance. Only the best of the best can be branded as King Caesar Oysters. This wasn't just a marketing ploy, but rather, an element of a new business paradigm that Paul learned from an unlikely source. "When I was a kid I was working part time for a lobsterman. He taught me that most commercial fisheries are a trap. A "Lobster Trap" as he described it. It traps fishermen and farmers into an unrealistic idea or goal. You think, "well, I could catch more lobsters if I bought more traps and a bigger boat." Well, if you do that, then you need more fuel and more bait. And maybe you have to hire another deck hand. Then on top of that, you have to do twice as much work. And meanwhile, the profits stay the same. Its a trap because once you get into the life you can get out, because once you've already invested into the boat and gear, its to late. I applied these lessons learned from lobstering into oystering." Growing a smaller amount of oysters would allow us to concentrate on the quality, not quantity. It all comes full circle back to the idea of the King Caesar Oyster the highest grade oyster available, sold in a limited amount. Despite all of the oyster nerdiness and paradigm shifts happening aboard the boat that day, Paul still had bigger aspirations for Duxbury. "We want to build an operation that teaches everyday people how to grow and harvest oysters. Farm tours and a "pick your own" oyster program would be at the heart of the operation. I've seen all sides of the business and the one thing that chefs and farmers have most in common is the love and respect of the oyster. People love learning about oysters, how they are grown, and how to harvest them. We want to give people that opportunity to find out first hand." Sounds like someone from one of those "30 Under 30" listicles. I for one predict that Paul will reach his goals and probably end up on Oyster TV. Why not? He and his crew are energetic, fun, and I'm pretty sure that the ladies love him. The Bad Boys of Duxbury Bay. It's going to be a hit! So about that batch that didn't quite make the 3-inch mark last summer... I was very lucky to have gotten the opportunity to savor them about a week ago with my family in Connecticut. I wanted to surprise my mom for her birthday, yet again, with oysters. It has become quite the Qiu family tradition! Paul, bless his heart, trekked out at low tide and used a chainsaw (I don't even want to know) to harvest them for my little party. Having survived through a formidable winter—New England has been hit over and over again with snow and ice this year—these oysters were remarkably plump and as savory as ever. Duxbury produces a distinct fruitiness in flavor, which felt compounded by the cool brine. Both mom and dad were quite impressed with their fresh, oceanic essence. The box of several dozen were obliterated in a matter of hours. Because of the crazy weather conditions, harvest has been hit or miss for most farms along the Northeast. This has resulted in significant shortages occurring across the country, and those who have the resources, strength, and sheer will have been reaping in the benefits. Many thanks to Paul, Matt, and the rest of the DBS crew for your hard work and patience. KING CAESARS ARE BACK, BABY! The availability of this beaut coincides with Paul's departure from Legal Seafoods in March 2017 for his new role as Director of Shellfish Operations at John Nagle Company. Many of you have asked me about where you can find King Caesars, and I should be frank. It is going to be very hard to find them! Shortly after this story went live, Paul landed a new job with Legal Seafoods as a shellfish purchasing manager. (Hooray for Paul! Sad for us.) Although he's not on the farm nearly as much, Paul still manages to post some of the slickest Instagram videos around. Although the Island Creek Oyster was born out of a spirit of cooperation, Island Creek Oyster Farm was never set up to be a co-op. Island Creek Oyster Inc. operates as a wholesaler—one that started out by marketing and selling a singular, awesome product. 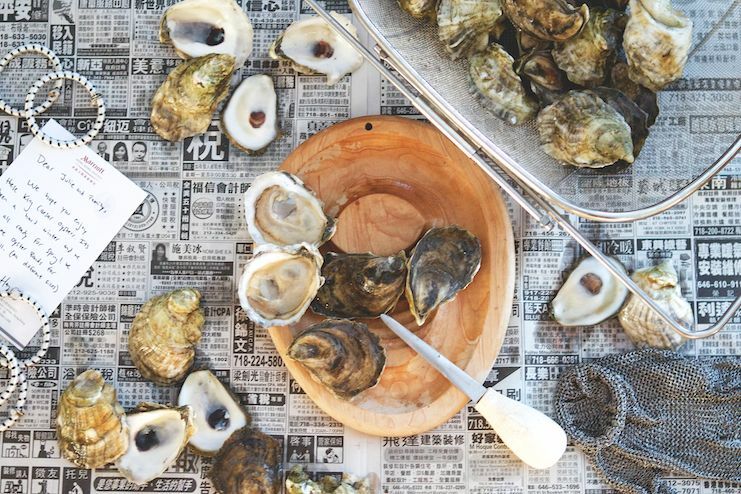 The wholesale business bought oysters that were farmed by Skip Bennett, Christian Horne, and many other independent growers across Duxbury Bay, and then sold them collectively under the Island Creek Oyster brand. This capitalistic model flourished up until the heavy blow of MSX in 2010-2011. Skip Bennett and Christian Horne were indeed the first people to successfully grow oysters in Duxbury Bay. Based on my convo with CJ, Skip also did a lot of the leg work in getting proper shellfishing permits/leasing process in place for others to follow. I found a Boston Globe article from last May that credits Bennett as the one, "who started it all."